← Does NingXia Red have Anything To Do With Ninjas? For Christmas I was given something that was on my last since the year before. 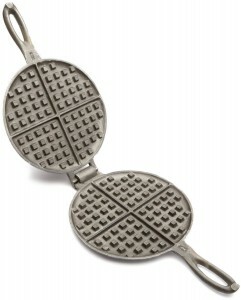 An Old Fashion Waffle Maker Iron. How exciting I thought as I opened my gift and seen it was the very Waffle Iron on my Christmas list! I knew the benefits of such a Waffle Iron were that I no longer would buy frozen waffles which may have ingredients in them that are not good for me. It also meant that because this was an Old Fashioned Waffle Iron, it was made 100% of cast iron. No toxic non-stick stuff here that could cause cancer. No sir/mam, this was the perfect one! 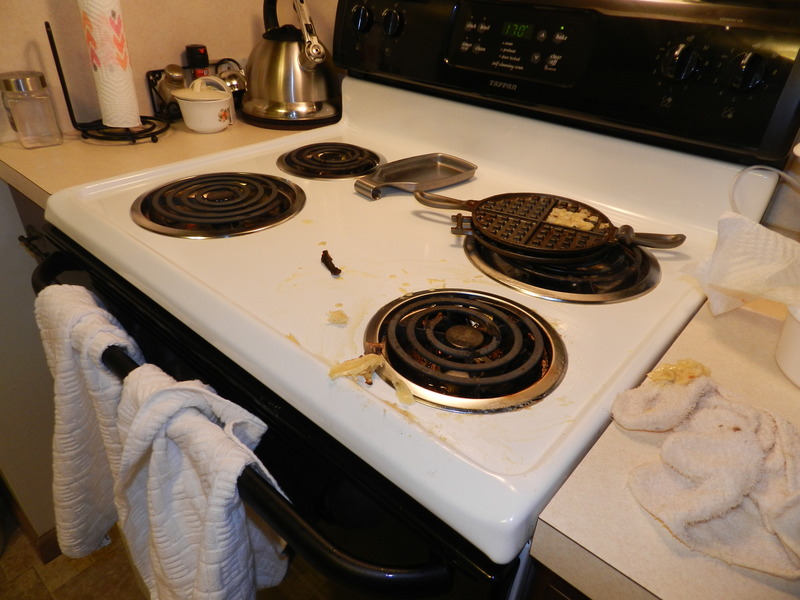 The first time I wanted to use the waffle iron, we discovered it came covered in wax to avoid rusting and that we had to get the wax off first. The directions said I could wash it in warm water with soap, or I could bake it off. I opted for the later, and that didn’t go so well. So once it cooled, my wife washed it with hot soap and water. The second time I wanted waffles, we discovered that it still wasn’t ready to be used, as it had to be seasoned first. Meaning that we had to put cooking oil (Olive oil was my choice) and bake it for one hour. The third time I wanted waffles, my wife tried to use it, but the waffle she made stuck so bad that she couldn’t get it off the iron. I managed to get three quarters of it off and finally eat a waffle! It’s then that things started to change for the better (kind of) in using my waffle iron. My best friend Shannon called me and gave me some valuable tips on using my Old Fashioned Waffle Iron. Tips I wouldn’t have known otherwise! So, I figured this time I’d give it a try. 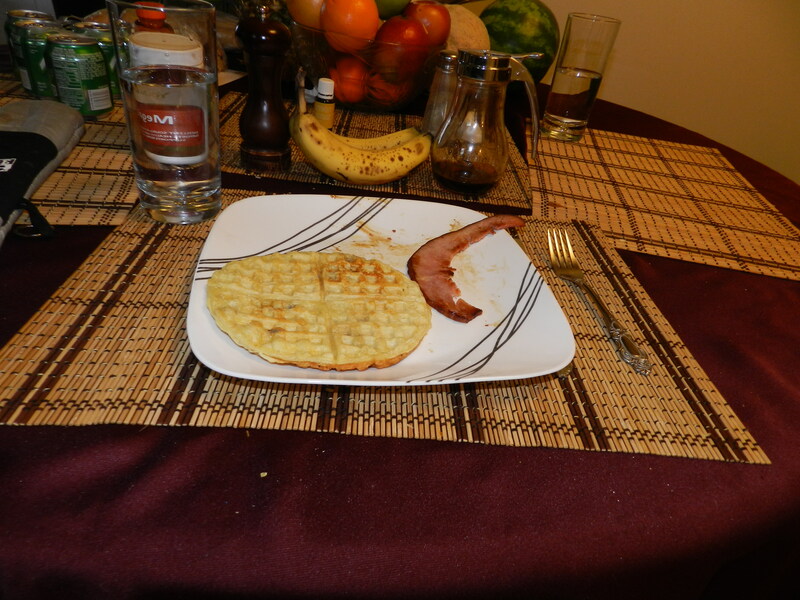 My first waffle didn’t stick at all and I was able to dump it out right unto the plate. Slightly undercooked, but not too bad. 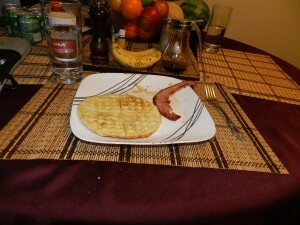 My second waffle I made came out perfect. A golden brown and it didn’t stick either. My third waffle was a disaster! I had put the outer end unto the other side, causing the mixture to squirt out unto the oven and into the burner! What a mess! And I didn’t use enough oil, so on top of it oozing out everywhere, it stuck too! Smoke filled the whole house. I refused to give up though! I let it cool, cleaned it off and make another waffle which came out good. You might be asking yourself at this point, what does this have to do with creating a successful business? Everything my friend. You see when you first get involved in Network Marketing, you can’t wait to get your starter package. It arrives in the mail, you rip that box open and are so happy to get started! You read all the directions, you sample some of the products, (maybe not in that order) and then you’re ready to get started! You tell someone you know about your great wonderful business that is going to change the world and their life, and they laugh you to scorn. You become somewhat discouraged and really don’t know what to do. Your upline calls you and gives you some valuable tips, and the next time you actually have success. Someone actually listened to what you had to say. Victory you think! You try it again, and again; another victory! Now at this point, you figure you have the hang of this Network Marketing thing. For a third time, you reach out to someone, and they give you verbal abuse, that makes you feel you’ve really made a mess of things. But you know, that if you just clean yourself up, look where you went wrong and go for it again, you can do it; and you do. Now success might not come on your first to third time. It might not come even on your one hundredth time or one thousandth time. But you know it will come, because you have the proof it works. Others in your upline are doing it, and you know you can to. So, let’s look at what you need. 1. You need to get started. Nothing will happen, unless you first take your first step and become a distributor. 2. You read the directions and follow the plan. 3. You use the products that were sent you. 4. You have a mentor (perhaps your upline, perhaps not; depending on their success level). 5. A tenacity to keep at it until you found the success you’re looking for. (Which means going through a lot of No’s and temporary failure, to get to the Yeses and success). This entry was posted in Network Marketing and tagged Dexter D Black, homebased business, network marketing, old fashioned waffle iron, success, success in network marketing, success principles for network marketing, tips for network marketing, Young Living, Young Living Essential oils. Bookmark the permalink.